Description: A-kit is a pack of drum plugins. It is low cost and very simple to use: just insert one of the seven modules in one of your audio tracks and start playing, driving the module thanks to MIDI. The plugins all respond to notes, velocitys and attacks instructions, giving a natural drum feeling. Set the level of interpretation from "stupid" to "mad" adds random modulation to your poorest drum tracks. Description: AlgoRhythmia is a random MIDI drumbeat generator. It generates patterns up to 4 measures long in any of six time signatures and at virtually any BPM. It allows the user to mutate or regenerate any or all of the drum sounds in a pattern and includes the ability to play .wav samples. It includes a library of .wav samples and allows the user to edit the individual notes in a drum pattern. Patterns can be saved to disk or exported to a MIDI file. Description: ARPTON SF Synthesizer Arpeggiator Player is an electronic musical instrument emulated in software. It turns a PC keyboard into a piano keyboard and uses sounds from many SoundFonts available on Internet. Arpeggiator creates amazing arpeggios and loops with endless variations. Even the beginner will become very comfortable with the program from the first step. Version 3.1. is a FREE unlimited version with automatic updates. Paid version is 3.2. Description: WIDI Audio To MIDI VST plugin automatically transcribes arbitrary polyphonic audio tracks into MIDI output displaying chords. Unlike the original audio record, the MIDI output can be easily edited. 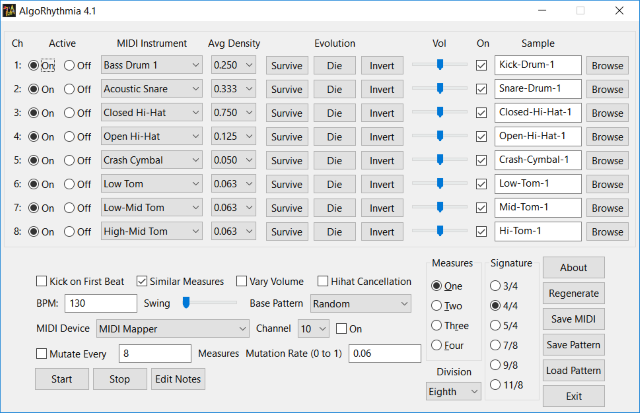 You can use this plugin for instant Wave-to-MIDI transcription while playing a musical instrument. The resulting MIDI output can be played back "as is" or used to control MIDI-driven effects. To use this plugin, you need VST-compatible software. Description: Audio WAV Mixer is a great sound and Audio WAV mixer software which allows you to mix any number of WAV files together. It can also be used for making remix songs for music lovers. It?s powerful audio mixing tool where anyone can create and mix his own tracks. Audio WAV Minxer makes the process easy for beginners with an easy-to-use interface and many features. Description: Cut, join, trim, mix, delete parts, split with AVS Audio Editor. Manage your tracks in MP3, FLAC, WAV, M4A, WMA, AAC, MP2, AMR, OGG, etc. Record audio data from various inputs like microphone, vinyl records, and other input lines. Create a unique ringtone for iPhone. 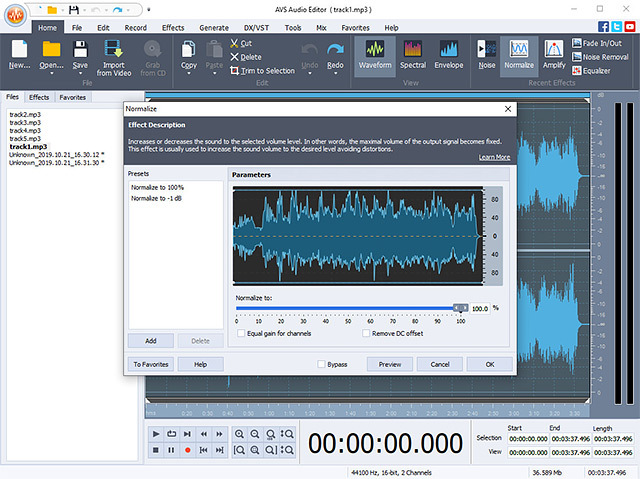 AVS Audio Editor is a part of the AVS4YOU.com package. Register once at avs4you.com and work with all tools from the AVS4YOU.com package. Subscribe for $39/year or $59/lifetime. Description: An easy to use multi-track recorder for musicians who want to record layered recordings without being forced to work with the complexities of a program geared toward dance music or other sample based material. Record multiple instruments and voices then mix to taste in real-time. Easily remove or replace individual tracks, allowing the use of guide vocals and instruments. Export your final mix in a common format such as WAV or MP3. 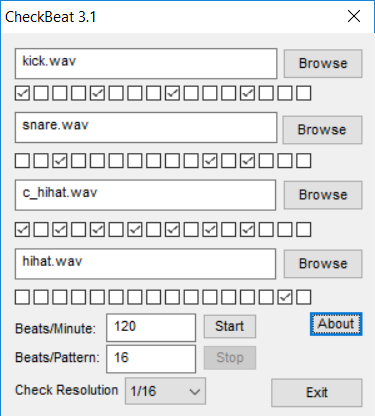 Description: CheckBeat is a simple checkbox-programmable sample-based drum machine with a user-configurable resolution from one quarter note to one thirty-second note. The user can set the BPM (any) and pattern length (up to 16). It was written using SDL2_mixer. Description: ChordEase makes it easier to play music with complicated chords. No matter what the chords are, you can play as if they were all in the key of C. You don't need to play sharps or flats, because ChordEase automatically adds them for you. ChordEase alters your notes in real time in order to make them harmonically correct, while preserving their rhythm and dynamics. By delegating music theory to ChordEase, you can focus on feel and aesthetics. Description: Click MusicalKeys is a MIDI musical keyboard software with 128 instruments. It looks like a real piano and you don't need to know about music notation and symbols. Play using your keyboard or mouse and save your favorite tunes in the MIDI file format. The new version supports echo effect in certain instruments that can be turned on by pressing F3 button of the keyboard and by selecting On in Echo. Supports touch screens.